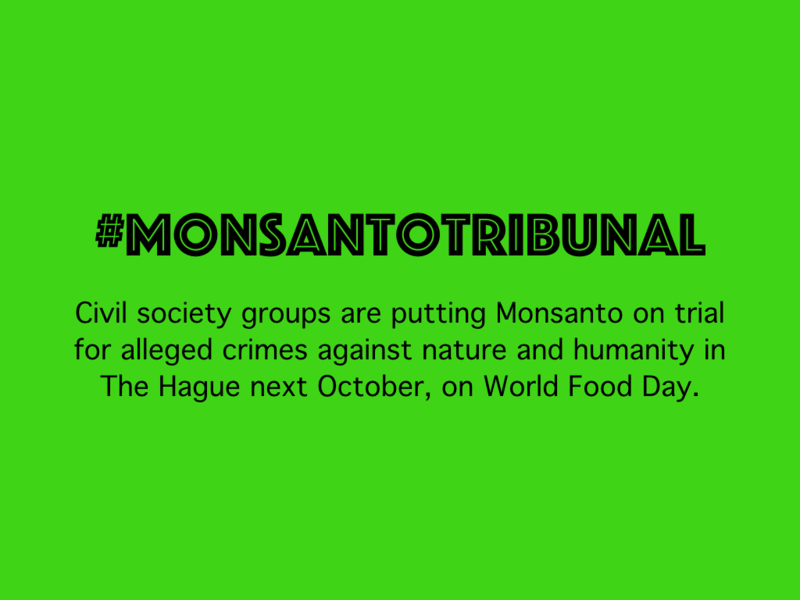 Civil society groups are putting Monsanto on trial for alleged crimes against nature and humanity in The Hague next October, on World Food Day. The announcement of the ‘Monsanto Tribunal’ was made in a press conference in Paris this week on the fringes of COP21, by an alliance of organic, food sovereignty and environmental groups. “Monsanto promotes an agroindustrial model that contributes at least one third of global anthropogenic greenhouse gas emissions”, stated the coalition of Organic Consumers Association (OCA), IFOAM International Organics, Navdanya, Regeneration International (RI), and Millions Against Monsanto, and others. Monsanto Tribunal standing committee members – including Vandana Shiva, Corinne Lepage, Marie-Monique Robin, Olivier de Schutter, Gilles-Eric Séralini and Hans Herren – will invite witnesses to testify on how Monsanto has allegedly corrupted the political system and the mass media and resorted to unethical and criminal tactics to reach their present state as the leader of the genetic engineering industry. As they put Monsanto on trial, the groups hope that this will serve as a lesson to all big corporations that keep putting profits over the people and the planet. The are also aiming to unite communities from all over the world at the grassroots level. There is a real reason why Monsanto is, say its critics, the most hated corporation in the world. They consider the company to be the ‘poster boy of evil’ through the pesticides they produce, especially their signature product, glyphosate. André Leu, an Australian organic farmer who is the President of IFOAM, the International Federation of Organic Agricultural Movements, said: “For years, RoundUp was regarded so safe, you could drink it. Regulatory authorities said we do not need to worry about. They did not even test for it in our food. It is because they behave like this, he explained, that people start to realise that these corporations have no problems to poison their children, their grandchildren, themselves and the environment just to increase their profits. As negotiators and civil society observers agonise over the wording in the draft documents that will lead to the Paris Agreement, the actual thing that needs to happen after the COP21 is to do the real work. In broad view, this means two things. One is to stop emitting carbon into the atmosphere. The other is to take the excess out of it. By launching the Monsanto Tribunal campaign during COP21, civil society groups and grassroots movements aim to expose the corporate control of the agrifood system and its ways of compromising real action for climate change adaptation and mitigation.